4.00101. Audio Myths- Ball bearings ABEC quality. 4.00102. Audio Myths- Oversize platter. 4.00103. Audio Myths- Magnetic bearings. 4.00201. What is the optimal matching impedance on phono inputs for MC cartridges? 4.00202. How long does it take for a cartridge to run in? 4.00203. What is the best tracking force for cartridges? In the audio press and in advertising it is often mentioned that tonearm manufacturers are using best quality bearings, stating ABEC 7 quality. Does this statement have any practical use? Let us check what an ABEC standard actually means. It is a US standard for classifying certain parameters of ball bearings. In this case it only guaranties that ball bearings are made to specific sizes and tolerances. The higher the number, the tighter tolerances of the bearing. In any production process when parts are made, their dimensions have to be specified. It is almost impossible, for example to make a shaft exactly 20.000 mm in diameter. In production tolerances are used, which tell us how much bigger or smaller than the exact 20.000 mm the shaft can be. For example for that shaft to fit a hole of 20 mm in bearing housing, it would need to be smaller. The shaft can be made 0.1 mm smaller or only 0.01mm smaller. The smaller the size variation which is allowed, the tighter is the tolerance and the more difficult to make. The same applies for the hole size. It can be made bigger for 0.1 mm or 0.01 mm. I believe you get the picture. ABEC standard ( US) or ISO ( European) prescribes only certain basic dimension tolerances of ball bearings. In ball bearings there is an outer and inner ring, balls and a cage which separates the balls. All these parts are made within certain tolerances to fit together and to be built into products. ABEC and ISO standards do not cover: radial play, surface finish, material, ball complement, number, size or precision level, retainer type, lubrication, torque, cleanliness at assembly, raceway curvature, packaging and other factors that may be essential to the desired bearing performance. I would like to emphasise a few of the most important parameters which are not covered by ABEC: Starting torque which affects the swinging of the tonearm up and down and following eccentricity of the record, noise level and vibration in bearings which adds distortion, cleanliness of oil which may restrict movements. It will not tell how precisely the ball bearings are fitted into the housing and shaft of the tonearm, which has direct influence on smooth zero play and movement of the tube in all directions and across the whole record playing area. When you read about the quality of the ball bearings in a tonearms ask yourself ˝Did they choose the right bearings and are they fitted in the best possible way"? Just stating ABEC means the same as declaring that amplifier A is the best because it has the lowest measured distortion and, as we all know, this has nothing to do with good sound itself. 4.00202. Audio Myths- Oversize platters. A larger platter with the same mass will, of course, be thinner than a smaller sized platter. The thinner platter will resonate more - that is also a fact. We can see that increasing the diameter by 10%( from 30 to 33 cm), gives only 21% and not double, increase in momentum. If, for example, two platters are made the same mass of 8kg, from the same material, then the platter with a diameter of 30 cm will be 4cm thick and 43 cm sized platter will be only 2 cm thick. You can easily judge by yourselves which will ring more. We do not want a platter that acts like a cymbal. So optimal size and thickness of a platter, together with the damping properties of the material used and its internal construction is the best way to make the best possible platter. At first sight - magic: A magnetic bearing with no physical contact and no friction! But I am sure you have held two magnets together and then tried to hold them apart at a fixed distance while the opposite forces were acting on each other. It’s a difficult task and almost impossible to keep the distance constant for any length of time. Now imagine a magnetic bearing where the shaft must be kept stable in its exact position without moving off centre while rotating. This is impossible to achieve with ordinary magnets. To achieve this you would need to monitor and continually adjust the exact shaft position, as the electromagnets forces are constantly changing. This would require a very sophisticated magnetic bearing system costing 10.000 dollars and which is used in very precise machines and which radiates a strong magnetic field. But we can make a simple magnetic bearing when the platter is levitated vertically and a classic sliding bearing holds the shaft in a vertical position. In this case there is no contact in a vertical direction, but the platter will behave as if it is being supported on a spring- it will bounce up and down. This is because magnetic force acts exactly like spring – the smaller the distance the bigger the force and vice versa. The practical solution is for the magnet to hold the platter up while the bearing shaft is still in contact with the trust pad but, due to magnetic lift, platter mass create less force on bearing thus making less wear and vibration. This method was first introduced in mid 60ties on the Stanton turntable where the magnet force ‘lowered the pressure' on the vertical bearing of the platter. How the platter bearing is designed and executed, regardless what trust force is applied on the trust pad, is most important. A good bearing should have minimal noise and friction and, at the same time, the shaft should not wobble in the bearing housing. In practise it is better to have less weight on the bearing, even though less weight might cause the platter to move up and down due to vibrations in the bearing. If there is a strong magnetic field below the platter it can effect the record and the cartridge. Demagnetisation of records does improve sound dramatically -just try the Furutech machine. There was much debate in audio circles some years ago about this. Some prefer loading to be as low as possible (a few ohms), some in the middle (800-1500 ohms), and some on the standard 47 ohms. Try for yourself. Rough guidance is as follows. The lower the impedance the bigger and closer the sound, the higher the impedance, the more distant the sound becomes, as if moving back in a hall. Results do vary according to whether you are using tube phono stages or transistor, matching transformers, different cartridges, damping, your system set up and your listening preferences. New cartridges need a minimum of 50 hours to be run in and only then should a final adjustment of azimuth and VTA be made. You should listen to at least a whole LP before measuring or making any adjustments. We usually recommend the highest suggested by the manufacturers. This usually means the best tracking but not always the best sound. With a higher tracking force the cantilever moves upwards and coils will not be in the optimal gap where magnetic flux is most linear. Try the range from maximum down to middle tracking force. Do not, however, forget that the biggest damage to the record grooves is mistracking, (when the needle is not touching the walls and then bounces back on it leaving dents) not high tracking force. M. Fremer wrote that the vertical Pivot Position ( PP) on the 4P9 is well below the arm and that the arm's Centre Of Gravity ( COG) is well above the pivot point. Viewing 4P9 from the side : cartridge, tube and upper part of the tower are above and heavier part of the arm and the counterweight are below the PP, positioning COG close to the PP which is also at record level. 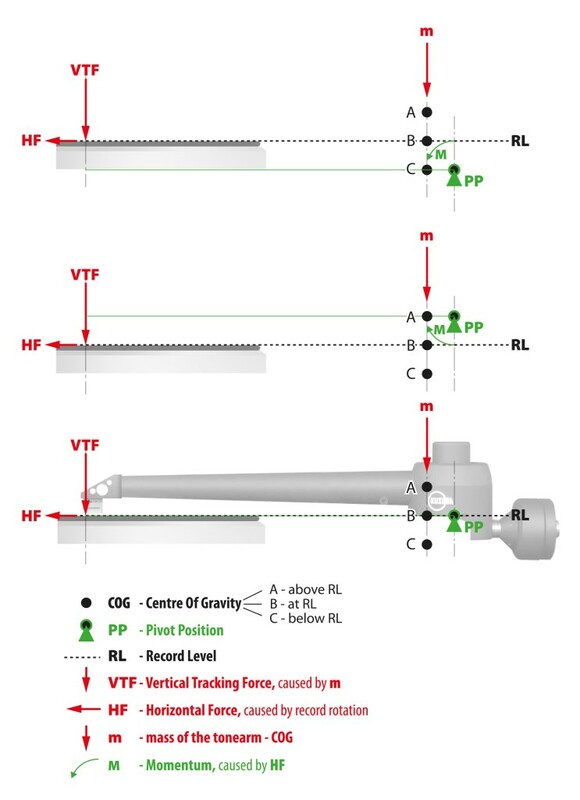 PP position in relation to the record level affects more tracking than COG height location which must be in front of PP to create tracking force (VTF). COG and PP can be above,at or below record level- designer's choice. On needle tip also acts Horizontal Force (HF) caused by surface friction increased by the grooves modulation. COG above PP: always pushes cartridge more downwards than at neutral level. This means that VTF will increase even more on the rise and decrease the least on the descent, thus giving the least chance for mistracking of a warp. PP above record level: HF will rotate tonearm and cartridge upwards, thus lowering VTF and creating potential for mistracking especially on warps. PP at record level as in 4Point arms: HF does not affect negatively VTF. All 4Point tonearms have the PP at record level and the COG just slightly above and in front of PP. In our opinion this is the best solution for tonearm's tracking.